It ignores at least one other group of philosophers, namely those that believed in (mathematical) theory mediated measurement. I am thinking of Galileo, Huygens, and Newton, among the best known. These are not best described as experimental, although all were accomplished experimentalists (and Newton’s Optics is often assimilated to experimental traditions), but their work has very different character from say, Bacon or Boyle. (They are also not best described as speculative, because all three practiced a self-restraint on published speculation.) Certainly after the Principia this approach created standing challenge to all other forms of philosophizing. So the Otago framework will run into big trouble in 18th century. We’ve already shown that, in fact, the terminology of the experimental philosophy is very prevalent in the 18th century and, moreover, that the experimental philosophy was extended beyond natural philosophy into moral philosophy and even aesthetics. 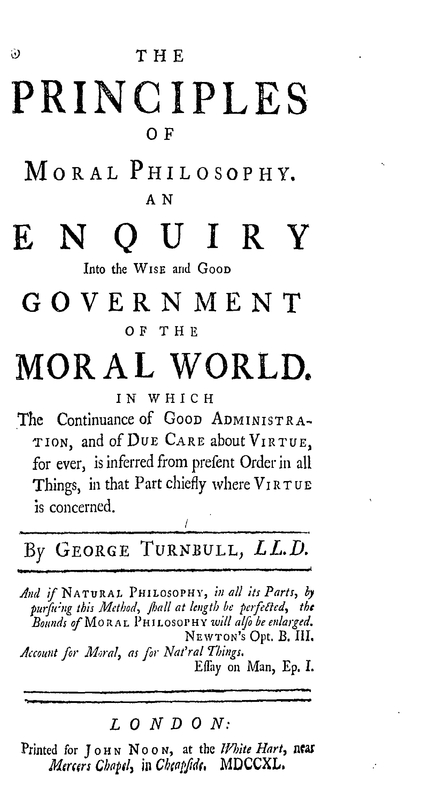 See, for example, the works of George Turnbull which are a good example of experimental moral philosophy. But the important issue Eric raises has to do with those who practised ‘theory mediated measurement’ such as Galileo, Huygens and Newton. What our research has shown is that the experimental philosophy was practised in two quite different ways. Up until the 1690s, Boyle, Hooke and the early Royal Society practised experimental philosophy according to the method of Baconian natural history. However, from the last decade of the seventeenth century Newton’s new mathematical natural philosophical method came to be seen as the preferred method of experimental philosophy. The Baconian natural history program started to run out of steam in the 1690s and it soon came to be replaced by the Newtonian method. This is, in fact, the explanation of Newton’s common refrain ‘Natural philosophy is not natural history’. And Newton himself had a large hand in the demise of the Baconian approach to experimental philosophy both through criticism and through his own positive alternative. Far from providing an exception to our framework, Newton, the self-confessed experimental philosopher, is one of the central players! Looking for sources for knowledge of experimental philosophy in eighteenth century Germany, I found some interesting texts by relatively unknown authors (at least beyond the circle of specialists). Christian Wolff is one of them. He was the most famous German philosopher in the first half of the eighteenth century. His philosophy was taught in many universities and his works were very popular. For instance, his German Logic knew no less than 14 editions during Wolff’s life. Wolff knew several British experimental philosophers. He cited works by Robert Boyle and Robert Hooke, he was the Locke reviewer for an important journal (the Acta eruditorum), and he polemized with the Newtonian John Keill on the existence of the vacuum. 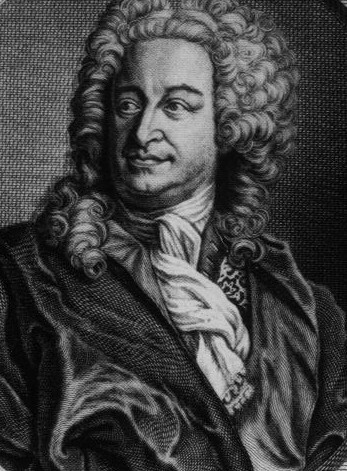 He is a good example of the fact that German thinkers were acquainted with the works and the methodological views of British experimental philosophers in the first half of the eighteenth century. A number of Wolff’s statements might make us think that he was himself an adherent to the early modern version of x-phi. Like British experimental philosophers, Wolff criticizes Descartes’ attempt to explain a great variety of natural phenomena in the light of few general principles that he established a priori. Like Hume and Hutcheson, Wolff is eager to extend the dominion of experimental philosophy beyond the boundaries of physics. He projects the disciplines of experimental cosmology, experimental teleology, experimental theology, experimental politics, and even experimental ontology. For his philosophical system as a whole, he chooses the name of “universal experimental philosophy” (philosophia experimentalis universalis). How could Wolff have been a more enthusiastic adherent to the program of experimental philosophy? indulges in hypotheses in those very areas in which they think he abstained from employing them […] In fact, what else is universal attraction or gravity, which is represented by a measure of attraction, if not a hypothesis which is assumed because of certain phenomena and then is extended to all matter? From some present events, they infer what they have to assume, in order for [the events] to follow [from it], and they posit that their hypothesis applies to all [similar] events […] To determine whether they did well to assume the hypothesis, they infer what follows from it on the basis of a correct reasoning, in order to compare it with the remaining events that they have either observed, or that they derive from observations. [They do this] in order to see whether what has been observed agrees with the hypothesis. If they find that [observations and hypothesis] are in contrast with one another, then they improve the hypothesis, and in this way they constantly move closer to the truth. how much theory owes to observations and how much, on the other hand, observations owe to theory, since observations perfect theory and theory in turn continuously perfects observations. He who is ignorant of any theory and does not have much ability to use the faculty of knowing will only discover obvious and mostly imprecise [truths] on the basis of observations. There would not be much progress, unless one could presuppose some theory; and the more [a theory] is developed, the more discoveries one will make by means of observation[s]. Unlike Newton, Wolff was no great scientist. However, the quotes above suggest that his methodology of science is worth a serious reading. His acknowledgments of the interaction between theory and observation sound modern. They sketch a version of the hypothetico-deductive method that might provide an interesting alternative to Newton’s strict inductivism. In summary, Wolff is a good example of the Germans’ knowledge of British experimental philosophy in the first half of the eighteenth century. His views are also interesting in their own right. So are Johann Nicolaus Tetens’ comments on observational vs speculative philosophy or Johann Heinrich Lambert’s distinction between theory-testing experiments and experiments that have a life of their own – two hundred years before Ian Hacking. More on this another time. In the next post, Kirsten will discuss Newton’s method, in particular his rejection of hypotheses and his use of queries. See you next Monday!